A 5-minute drive from Saint Nazaire Train Station, Chez Nous offers a bar, a restaurant, and Wi-Fi is free of charge throughout the property. The hotel is a 10-minute walk from the beach. The rooms and studio at Chez Nous feature a TV, a wardrobe, and the bathroom and toilet facilities are shared. The studio also includes a kitchenette. A continental breakfast is available daily, and the restaurant offers traditional French cuisine. Grocers and shops are just a 3-minute walk away. 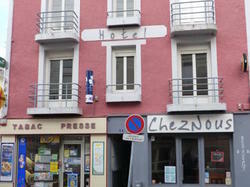 Chez Nous is 30 metres from Leferme bus stop, which offers direct access to the city centre, and free public parking is possible at a location nearby. This single room has a TV, a desk and a wardrobe. It includes a private bathroom with shower and toilet. The room features a TV, a wardrobe, and the bathroom and toilet facilities are shared.